Take Peppa to the School House for a special class with Madame Gazelle! Then Mummy Pig can pick her up in the classic free-wheeling car! Includes, Desk, Bench and Easel. 3 articulated figures included. This toy costs approximately £24.99 (for the latest and best prices make sure you check our retailer list for the Peppa Pig School and Family Car Playset above). 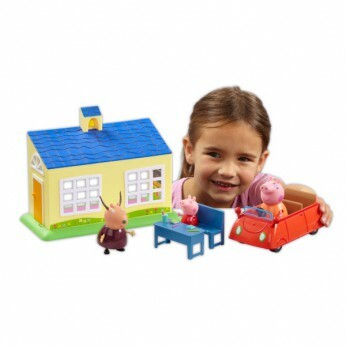 In our review of Peppa Pig School and Family Car Playset we classed it as being suitable for ages 3 years, 4 years, 5 years but recommend you check the manufacturer specific advice before purchasing.